As we are in the final week of Black History Month, another significant birth date has passed. Yesterday for our website’s Your Black History series, we featured a story about Malcolm X on the day his wonderful soul departed this earth. However, yesterday was also the day another valiant fighter for civil rights was born. 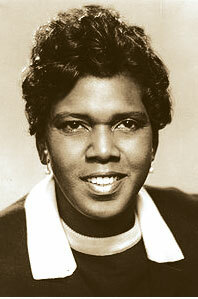 Today, Black-BlueDog.com will give a belated but elated happy birthday salute to the late great Barbara Jordan. Barbara Charline Jordan was born February 21, 1936 in the Fifth Ward of Houston, Tex. Her father, Benjamin Jordan was a Baptist minister and her mother, Arlyne Jordan was a social worker. Barbara was raised in a household that cultivated her personal achievement as a child. In 1952, she graduated as an honors student from Phillis Wheatley High School. During her high school years, Jordan listened to a speech given to students at her school by Edith S. Sampson. After hearing Sampson speaks, Jordan was motivated to become an attorney. Initially, Jordan wanted to attend college at The University of Texas at Austin. However, the school still practiced segregation at the time. Still determined to enter college, Jordan opted to attend Texas Southern University where she majored in political science and history. While attending Texas Southern University, Jordan got involved in debate and became a national champion. Her wit and political savvy helped her defeat more experienced debaters from prominent Ivy League schools like Harvard and Yale. Jordan also pledged as a member Delta Sigma Theta sorority at Texas Southern. In 1956, the future civil rights legend graduated with top academic honors from Texas Southern University. After her extraordinary experience at Texas Southern, Jordan entered Boston University School of Law. As a law student, she excelled academically. In 1959, she fulfilled her high school dream by graduating from Boston University School of Law. In 1960, she returned to Houston to take the bar exam, which she passed. Jordan then began her own private legal practice later that year. Jordan’s next goal was to become a member of the Texas House of Representatives. She ran for the office twice unsuccessfully (1962, 1964). However, Jordan’s determination never failed her. In 1966, she ran for the Texas State Senate and was victorious. Jordan was the first Black American to hold a state senate seat in Texas since 1883. She was also the first Black woman ever to serve in that legislative body. In 1972, Jordan thrust herself into the national scene by getting elected to Congress. She was the first woman to represent Texas in the U.S. House of Representatives. Jordan’s commitment to civil rights for Blacks did not stop once she got elected to Congress. In 1977, she supported the Community Reinvestment Act of 1977, which was a law that required banks to provide financial services to assist poor and abandoned Black, Hispanic, and Asian communities. Two years before her death, Barbara Jordan was given the Presidential Medal of Freedom by President Bill Clinton (the good ol’ days). Famous landmarks have been named after Jordan (main terminal at Austin-Bergstrom International Airport) and her legacy has been immortalized in a play (Voice of Good Hope). Happy birthday to you Ms. Barbara Jordan and may the spirit of your lifetime dedication to the rights of all oppressed people live on.